Happy Chinese New Year everyone! This is our first CNY and we are no longer on the receiving end. From additional small "income" to huge expense that we got to incur yearly :( We were also debating who should be the one giving out (based on my observation, it is always the "mother/aunt" giving out). lol. 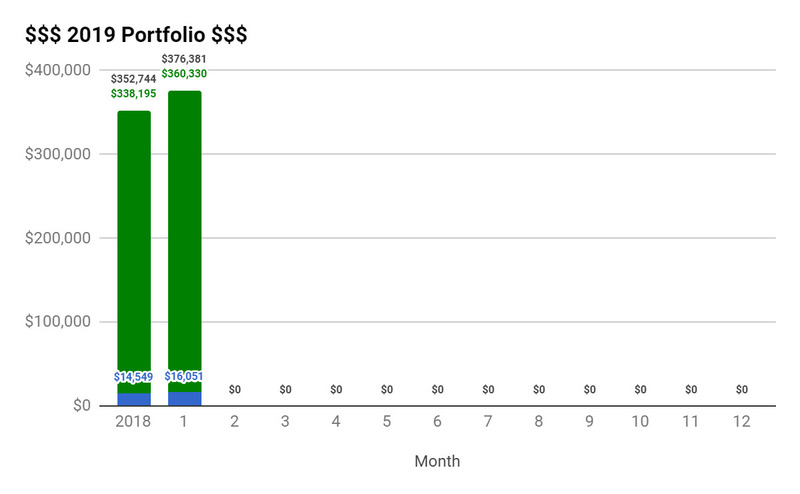 On the bright side, the market has recovered so much that we would have met our target based on this month portfolio - Portfolio Performance in 2018. Our portfolio increase by 6.70% to $376,381 - $728.00 of capital injection and (surprise, surprise!) $22,908.40 of capital gain. The one in blue is the StashAway portfolio, green is SGX and the total is in black. If you prefer to look at numbers, this is the raw data used to generate the above bar graph. These numbers are as of the last day of the month. We did not buy or sell anything last month because the "recovery" makes all the stocks look relatively more "expensive". As a result, I did not buy Lion-Philip S-REIT ETF too. CZM is asking why am I trying to time the market >.<" The $728 capital injection is from our $1,000 monthly investment into StashAway - $272 dividends received from Singtel.